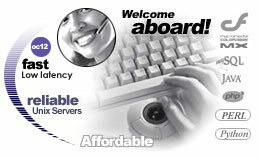 Web hosting by CQhost.com - JSP JAVA hosting - PHP 5 hosting - COLDFUSION 9 hosting - PHP hosting with MYSQL. in choosing a domain name for you or your company. 35 GB of webspace, unlimited emails, SSH, JSP, PHP5, Mysql, Coldfusion from $16.50/m. 45-day money back guarantee. Java Server Pages (.jsp) and Servlets + JDBC Mysql / JDK 1.7 are now supported FREE. Java engine: Resin 4.0 /Tomcat 6. Coldfusion 9 is now available. FREE with all plans. is available with our packages.